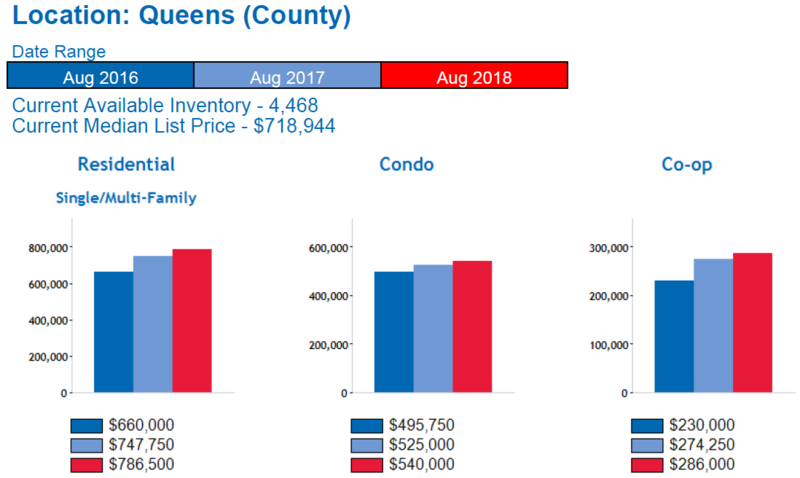 Queens Real Estate Market Report September 2018, provided by the Queens Home Team at Keller Williams Realty Landmark II. Need help? Feel free to Contact Us anytime. September is here and it marks the last month of the third quarter. So far the third quarter has followed the same trend that we’ve seen in the first two quarters of the year. The main difference we are seeing this year (Jul – Sep) vs last year (Jul – Sep) is the fact that interest rates and month’s supply are higher this year. 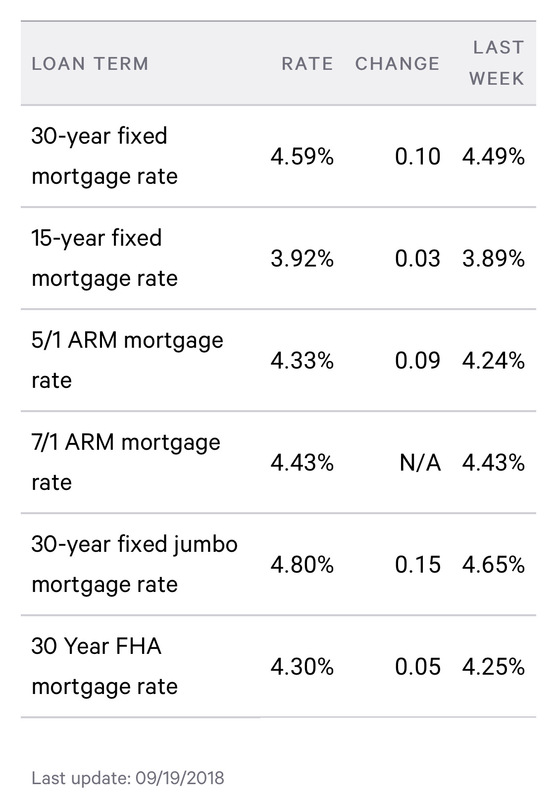 For example, right now interest rates are in the mid-high 4’s (4.5% – 5%) and at this time last year, interest rates were at 4%. As for month’s supply, last year at this time, month’s supply was 5.4 months and right now, month’s supply is 6.4 months. In case you don’t follow this blog, month’s supply below 6 months is said to favor sellers (i.e. seller’s market) and month’s supply over 6 months is said to favor buyers (i.e. buyer’s market). In our experience, a true buyer’s market doesn’t really become apparent until month’s supply hits 8 months or higher. So, right now I would say that we are still in a balanced market, however, month’s supply has been growing every month this year so if this trend continues, we could be seeing a more prominent buyer’s market by 2019. Regarding home sales, they have continued to slow this year and in August, we actually saw the largest year over year decrease, dropping a significant 18.1%. We still attribute the drop in sales to higher interest rates, but it can also be that in combination with the continually high prices across Queens. The good news is that we continue to attract Brooklyn, Manhattan, and foreign buyers so that will hopefully maintain sales in the borough. As for home prices, the median home price is still up significantly year-over-year (14.5%), but when you break it down by property type, the numbers tell a slightly different story. For example, the median price for residential 1-3 family homes is up 5.2%, the median price for condos is up 2.9%, and the median price for coops is up 4.3% compared to the same month last year. This lets us know that while prices are definitely still up, they are not rising as dramatically as they were in recent years. Lastly, when it comes to inventory, we currently have 4,467 homes for sale in Queens. This is up 16.6% compared to the same month last year. This increase in inventory, coupled with the dip in home sales, is what has led to the increased month’s supply. Months of supply is the measure of how many months it would take for the current inventory of homes on the market to sell, given the current pace of home sales. For example, if there are 50 homes on the market and 10 homes selling each month, there is a 5 month supply of homes for sale. Absorption rate is the rate at which homes sell in a given area during a given time period. Absorption rate is calculated by dividing the number of sales in a given month by the number of available homes for sale. For example, if there are 100 homes listed for sale in a certain area, and 10 homes sold over the last month, then the absorption rate is 10/100 = 10%. Being that closed sales are a lagging indicator, we calculate Absorption Rates using pending sales from the previous month and this gives us better insight as to where the market is right now. *Month’s supply and Absorption rate can vary by neighborhood and property type. The Long Island Board of Realtors reported Queens home sales at a rate of approximately 728 homes during the month of August. This was an increase of 3.7 percent from July and a decrease of 18.1 percent from August of last year. 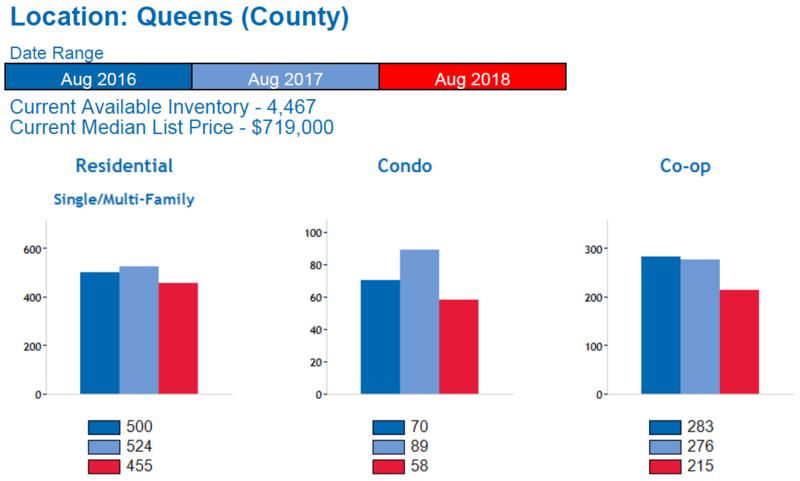 Specifically, our Queens real estate market report September 2018 shows that Residential home sales were DOWN 13.2%, Queens Condo sales were DOWN 35%, and Queens Coop sales were DOWN 22.1% compared to August of last year. Over the last 6 months, Queens home sales are DOWN 4.3%. The median home price in Queens rose to $612,500 in August, this is an increase of 4.3 percent from July, and an increase of 14.5 percent compared to August of last year. The median home price has increased by approximately $25,306 since last year. 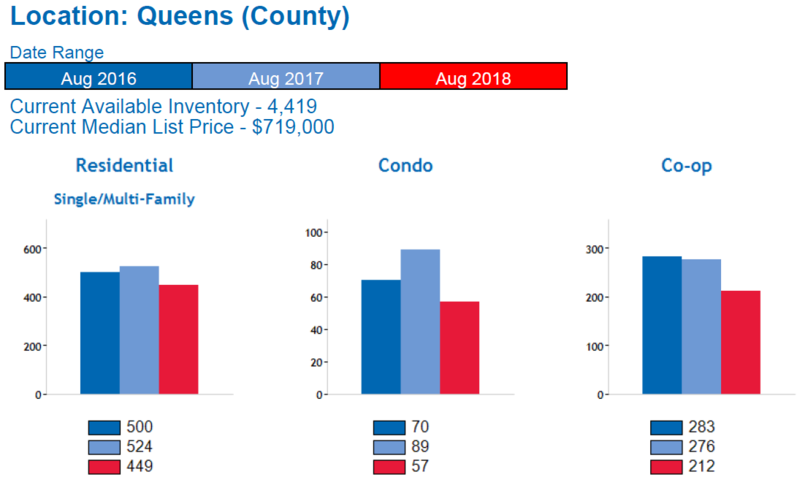 Specifically, our Queens real estate market report September 2018 shows that Queens residential home prices are UP 5.2%, Queens Condo prices are UP 2.9%, and Queens Coop prices are UP 4.3% compared to August of last year. Over the last 6 months, the median home price in Queens is up 11.4%. There is currently a 6.4-month supply of housing inventory in Queens, this is exactly the same as the 6.4-month supply we had in July, and up from the 5.4 month supply we had in August of last year. There are currently 4,467 homes for sale in Queens. This is an increase of 3.1 percent compared to last month, and an increase of 16.6% compared to August of last year when there were 3,831 homes for sale in Queens.